Simeonie Tuckatuck, 58, who has been living homeless in Montreal for three years, panhandles indoors at the Promenades Cathédrale near the McGill metro station in Montreal. Photo by Dario Ayala / Material republished with the express permission of: Montreal Gazette, a division of Postmedia Network Inc.
At any given time there are 150 to 200 Nunavik Inuit in Montreal accompanying a loved one receiving medical care. The lack of basic services in their northern communities forces a vast number of Inuit to fly south to receive treatment in the city. Once they arrive, many Inuit opt to stay in Montreal in an effort to avoid negative social situations at home. After decades of horrific government programs targeted at altering the Inuit’s way of life, social and economic issues have inevitably arisen in formerly prosperous communities. Devastating repercussions stemming from residential schools, widespread sled dog slaughter, forced sedentism, and seal bans have shaken communities. For many, mental health has been severely affected; addiction, domestic violence, and alcohol abuse are symptomatic of the hardships experienced by many. Already difficult social situations are exacerbated by lack of adequate modern housing—almost half of families live in overcrowded or deteriorating homes. Both positive and negative forces have led many Nunavik Inuit to seek new lifestyles in Montreal, be it for opportunities in education and employment, or to escape overcrowded or abusive homes. 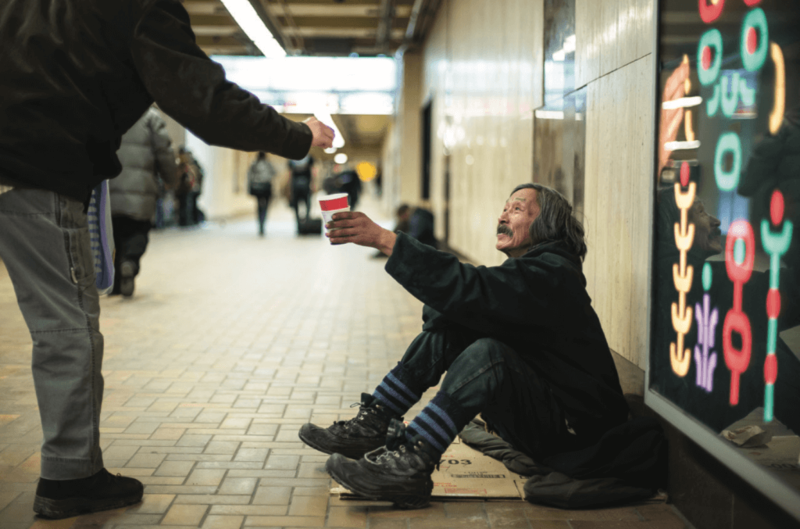 However, many find themselves in vulnerable situations in a new city vastly different from home, which has led to a disproportionate number of Inuit represented in the Montreal homeless community. 49% of Nunavik Inuit live in crowded homes. The housing crisis in Nunavik exacerbates health concerns and creates tension in families where abuse and addiction may already be a problem. 55% have a food insecure household. Fly-in only communities pay an exorbitant amount for imported food, and it is becoming harder to rely on traditional food sources. 39% have a regular family doctor. Most communities only have access to an outpost nurse, and hospitals and doctors’ offices often care for multiple communities at once. 446 sexual assaults were reported in 2017, almost 4% of the population. Many women report situations of domestic violence and sexual abuse to be the main reason they decide to migrate south. 60% of Nunavik residents flew to Montreal for health care-related reasons. About 8,000 people travelled south for things like cancer treatments, CAT scans, or surgeries that are simply not available in Nunavik. 10% of the Indigenous people in Montreal are Inuit. But Inuit people make up 45 percent of the Indigenous homeless population in the city. A disproportionate number of Inuit slip into homelessness after landing in Montreal. 71% of homeless Inuit said they would return home if housing conditions improved.